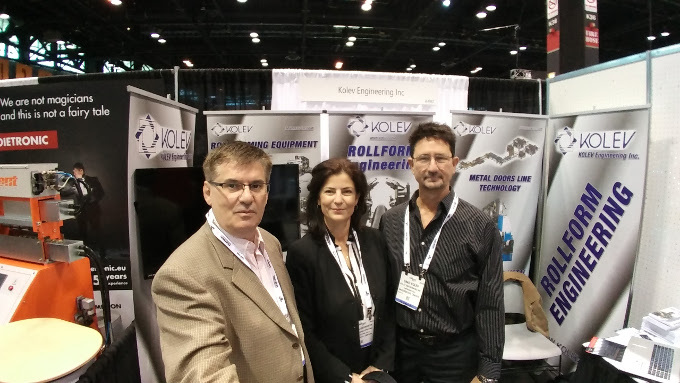 A Very Successful FABTECH Tradeshow on Roll-Forming Technology for KOLEV Engineering at Chicago. 2017 FABTECH was hosted at Chicago’s McCormick Place. KOLEV Engineering Inc. exhibited its experience and expertise in Roll-Forming Technology. The company is an expert in custom designing & manufacturing of roll forming equipment, roll tooling, and turnkey rollforming systems. This year FABTECH Chicago attracted a large audience of exhibitors, attendees, and presenters. All North America leading companies in the roll forming technology sector were present including KOLEV Engineering. The company is headquartered in one of the most advanced industrial zones of Canada – Mississauga, Ontario province. It has been designing and manufacturing roll forming machines and systems for more than twenty years now. The FABTECH brochure indicated the presence of more than 1,700 exhibiting companies showing the latest metal forming, including roll forming, and metal fabricating technologies. KOLEV Eng. team was excited to be presenting once again at the 2017 FABTECH expo in Chicago. While our sales team was scanning tags and answering sales and marketing questions, our roll forming technology expert and author, Dako Kolev P. Eng. was giving expert advice to project managers, engineers and owners of SMB from varies metal fabrication trades. This year we had a complementary item to KOLEV Eng. FABTECH exhibition – a newly published book on roll forming technology. Rollforming 101: How To Choose The Right Technology was authored by the founder and the president of KOLEV Engineering Inc.. The book is an essential guide that helps the reader develop a better understanding of roll forming line configuration, rolls tooling design, and troubleshooting in roll forming. KOLEV Eng. and its experts are ready to answer questions and provide a free consultation to anyone planning to start a roll forming project or considering to increase its productivity with roll forming equipment. HAVE A ROLLFORMING PROJECT IN MIND? REQUEST A QUOTE!